Wow, it's been almost two years since my dilemma over continuing to post on this blog. I got one comment in response to that post, hence a resolution. I continue to resurrect those abused and neglected pieces of furniture but no longer post about them here. Please use the Facebook link to the right and visit the Ode to Grace Facebook page. Hard to believe that I started this blog almost two years ago and up until January of this year, I posted regularly. Though I haven't written a post since Jan, I have continued to update the pages (For Sale and Gallery) regularly. I find that keeping them updated provides me with a visual catalog of my completed projects. My dilemma - for anyone unfamiliar with blogger software, it does provide an overview of daily pageviews (count only, no identifying information). Problem is, I seriously doubt its accuracy. In two years, I've received less than 20 comments and probably half of those were my own (so, 10 comments). It doesn't make much sense to resume regular posting if it's of no interest. If it is of interest, I need some feedback in order to know that. PLEASE... if you stop by occasionally to see what's going on, just leave me a comment so I'll know that someone really did stop by. I know that everyone's time is valuable, so if you'd rather see less detail (just the facts, maam), I can easily edit the structure and just include paint information and very brief background (or not) along with "before" and "after" photos - just leave a comment. Either way, I will continue to keep the "For Sale" and "Gallery" pages of this blog updated - as much for my own information as anyone else's. Thanks!! Many, many months ago (over a year) an old, orphaned armchair joined my inventory... and there it sat while I waited for inspiration to strike. 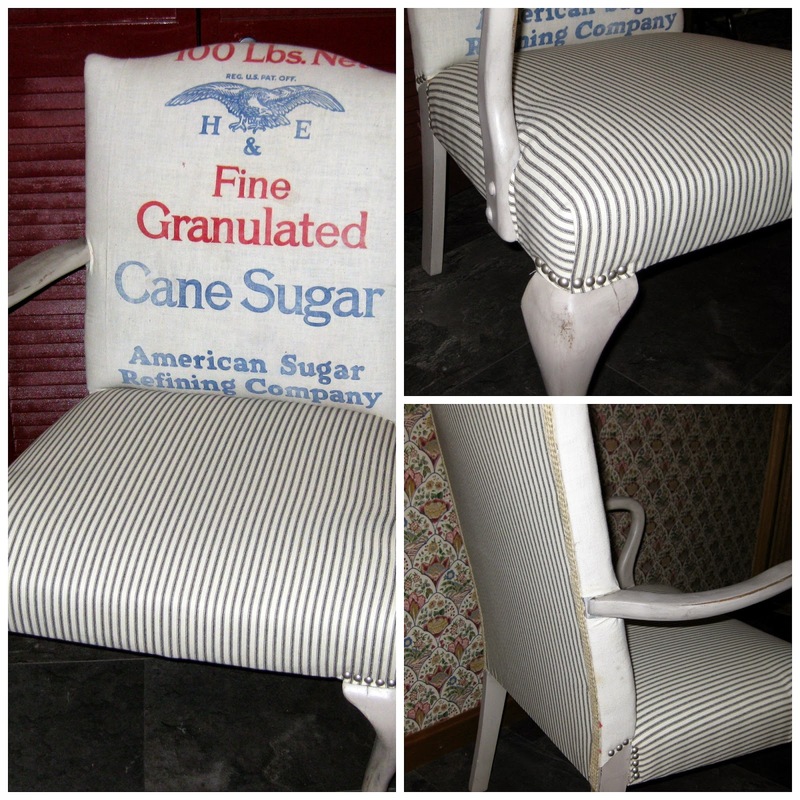 I've used dropcloth for upholstery before with great results so using a stenciled dropcloth was definitely an option. I really like the grain sack look but I didn't have one and whenever I looked online, they were expensive! So recently when I went to a local antique show, I was excited when I found a vendor there who had two sacks in good shape. More than a year later, I finally knew what I wanted to do with this chair! The frame of the chair is painted with HM chalk paint using a mistint from Behr. The seat and back of the chair are upholstered with black/white ticking. Winter has arrived here in New England and though the ground isn't covered in snow yet, for the most part the days are chilly & dreary. That doesn't mean that the furniture rehab activity stops - it just moves inside! I'm still working on reducing the size of my stash and I just finished this ladies dresser. I chose a color that reminds me of a warmer season and a brighter day - a soft, buttery yellow (SW's Butter Up) that I used for HM chalk paint. The top was restained with GF's Java Gel and protected with Wipe On Poly to give it a nice, soft sheen. The body is protected with Americana Decor's Clear Wax. The hardware is original but it was painted to complement the other details on the dresser - the carved embellishment on the top drawer and the painted corner detail on the bottom drawer. The drawers are lined and the mirror was missing, so it has been replaced. This is the dresser "before" - kinda reminds me of a chilly, dreary winter day! As soon as I saw this old chest of drawers, I knew it was a good candidate for poster decoupage. I've done decoupage before but I hadn't done a large poster before! So, I watched lots of You Tube videos, and then I procrastinated because I was a little hesitant to start. I wanted it to make a statement and I had found the perfect poster at Hobby Lobby but the nearest Hobby Lobby is about 90 min. away and I had only had one poster. If I made a mistake and had to start over, there would be travel involved. First up was to remove that oval "thingy" on the top drawer. Turns out it was glued on and since the chest is old and the glue was dry, it didn't take long to pry it off. Since it's darn cold now here in New England, I couldn't just put the chest outside and take the electric sander to it. But... I was nervous about that shiny finish. I wiped it down with a liquid deglosser and then primed it with Glidden Gripper. The original hardware definitely didn't fit with my vision, so it had to go; which meant there were screw holes in the drawers to fill. 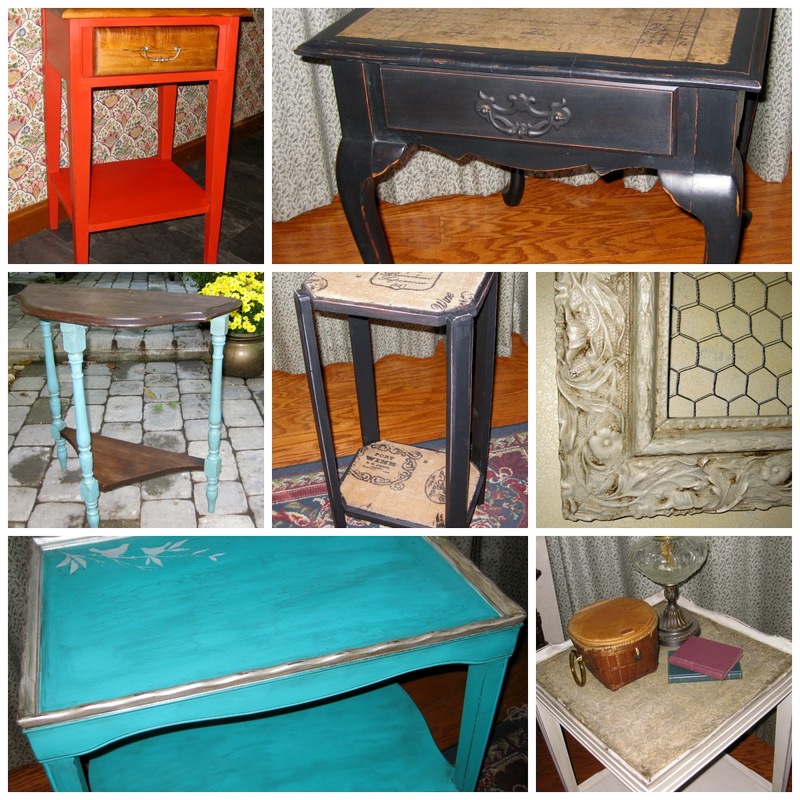 I sometimes make my own chalk paint and I also like to try the other options for chalk paint that are available. Recently I was sent a free sample of Websters Chalk Powder so mixed it with Valspar's Cocktail Dress. It covered well using two coats. The entire chest is glazed with Valspar Glazing Medium and the top and sides are protected with Sheer Vax. The drawers are protected with two coats of GF Satin Urethane. I'm so happy with the way this turned out and yes, it was worth the angst! I haven't posted in a while but that doesn't mean I haven't been busy! I've done several small projects and since the process (prep, paint, distress, protect) was basically the same for each, it seemed redundant to write a separate post for each. Here are the after photos for a few of those - some have sold & some are available. All are listed on either the "For Sale" or "Gallery" page. I painted the base of the table black (HM chalk paint using BM Twilight Zone) and stained the top and the drawer with Minwax Special Walnut. I don't even know if you can buy this shade of stain anymore but I've picked up a few cans at yard sales/estate sales so I combined them all and now have a quart. I like this shade, so I'll be using it for a while! I wanted to give a little interest to the top so I stenciled a simple black geometric design in each corner, then sanded to soften the look. The top is protected with two coats of Wipe On Poly and the base is protected with Americana Decor dark wax. and.... here's a sneak peek at my next project. I can't wait to get rid of all that shine! Fall has definitely arrived here in New England and, unfortunately, when fall arrives Old Man Winter can't be far behind. A few things change in my rehabbing furniture routine as well - except for an occasional "find," I'll begin working my way through the inventory that I've been accumulating all through the spring and summer months. Also, the location of my "workshop" changes. Instead of working in my garage and/or driveway, I do most of the work in my kitchen. Oh, how I envy those that are lucky enough to have a dedicated, year-round work area! I had already done some sanding before I remembered to take the photo, but you get the idea. It wasn't in horrible shape but definitely needed an update. Both colors on the body are Behr mistints used in HM chalk paint. It's distressed and antiqued; the top was sanded down and restained with Minwax Fruitwood. The hardware is vintage but not original to this piece. The dresser sold within 24 hrs of being listed.